A week ago, as wildfire blackened so much of Waterton Park and adjacent ranch-land, the chest of treasures overflowing with Annora’s paintings remains intact and becomes more precious than ever. Meanwhile, our effort to revive the full story of her life and legacy moves ahead with great gusto. Diaries and a picture portfolio of several of her paintings, once thought lost, have been found and are in safe keeping at Lethbridge’s Galt Museum Archives. The Annora Brown website is regularly being up-dated. It now includes pictures of paintings and script of the exhibit that was curated by Mary-Beth Laviolette for the Galt Museum (summer of 2016). 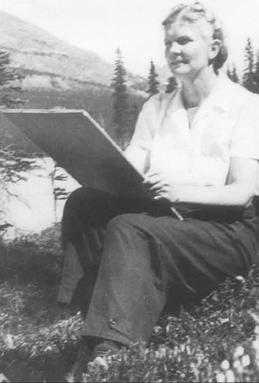 The Art Department, University of Lethbridge, now includes her life and legacy story in their teachings. Athabasca University is looking at how to embrace this treasure. The Digital Communications program of Lethbridge College is going to film our drama, based on Annora’s autobiography “Sketches from Life”, so we can make it available as an educational tool for teachers. The publication of a book of Annora’s paintings is being given serious consideration. With the help of so many, this woman’s wonderful contribution to our lives is being fanned back to life. Before more formal work can be completed, the time has come to form an “Annora Brown Society”. Details need to be worked through with the help of her family, who are following our endeavours. Oft times folks complain their community has nothing to offer their young people. In Annora Brown’s case, she chose to remain in Fort Macleod and make the region the centre for her many artistic and educational endeavours. Through her work she brought southern Alberta into focus on the National and International stage. YOU can step forward now by acknowledging and celebrating what she has accomplished. Let us know you want to be part of an “Annora Brown Society”!